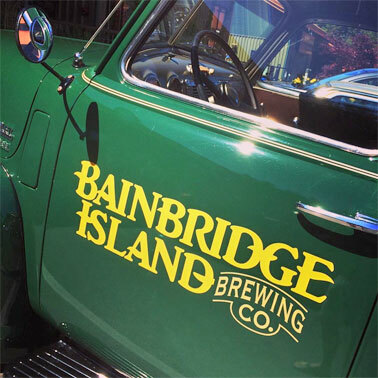 Bainbridge Brewing is an independent craft brewery on Bainbridge Island, now with two locations: Brewery & Taproom located at Coppertop Park (all ages welcome): and Bainbridge Brewing Alehouse in Downtown Winslow (ages 21 and over). We’re just a short ferry ride from downtown Seattle, or a quick ride along SR 305 across the Agate Pass Bridge from the Kitsap Peninsula. We take great pride in our craft brewery and know there’s a lot that goes into making the island’s most delicious brews. We use only the very best ingredients to produce our craft beers, most of which are from great Northwest maltsters and WA and OR hop growers. The Brewery & Taproom and the Bainbridge Brewing Alehouse both serve up more than just a deliciously cold pints of craft beer. We also have several tasty snacks, NW hard ciders, and soft drinks. And at the Alehouse, we have wines produced by island vintners as well as other NW and West Coast wines. Our craft brewery produces a wide range of beers including year-round beers, special seasonal beers, unique Sandbox Series experimental beers, and barrel-aged and sour beers. We also have guest taps from other NW craft breweries, cideries, and wineries. The brewery produces a wide range of craft beers including year-round beers, special seasonal beers, unique Sandbox Series experimental beers, and barrel-aged and sour beers. We also have guest taps from other NW craft breweries, cideries . Learn more about our beer. Since 2012, we have had great success brewing award-winning craft beers. Besides the Taproom and Alehouse, you can find our bottled beer at many Western WA grocery and specialty beer/liquor stores. Plus our draft beer in local pubs and restaurants. Learn more. 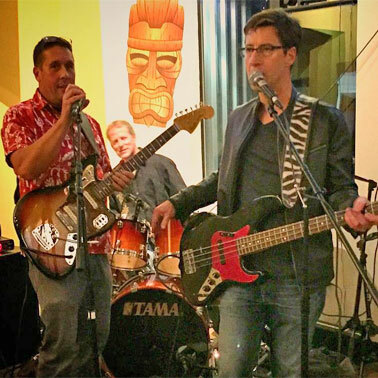 Something fun is always happening at the Brewery & Taproom and at the Alehouse. Come in and relax with a deliciously cold glass of craft beer or hard cider, get a glass of wine at the Alehouse, have fun playing weekly trivia at both locations, catch the local sports team on TV, beat your friends at pinball, play a board game, listen to a band or DJ, or meet up with your friends. See the full list of events. 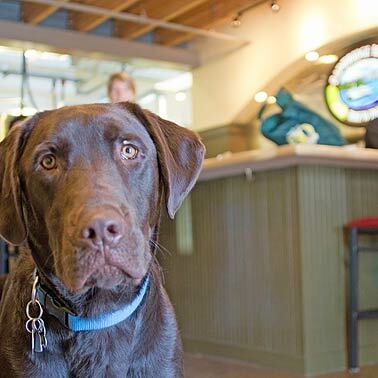 Its OK to bring Fido the next time you visit us at the Brewery & Taproom and the Bainbridge Brewing Alehouse. As long as Fido is a good dog (quiet, behaved, and on a leash) and you adhere to the posted pet policy. People often ask if kids are also allowed. At the Brewery & Taproom, the answer is yes! Here we operate under a Microbrewery license and all ages are allowed. At the Bainbridge Brewing Alehouse, however, we operate under a Tavern license and serve wine which is strictly for patrons aged 21 years or over. The Brewery & Taproom is about 2 miles from the ferry terminal in downtown Winslow. We love when people walk or bicycle. 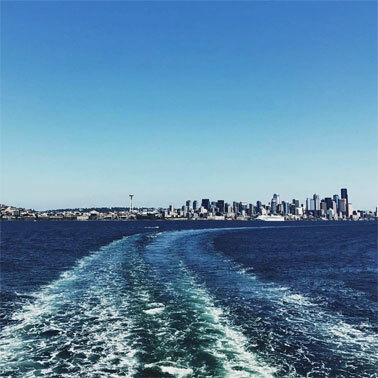 But if walking or two-wheeled transport isn’t your thing, you can catch a ride with Kitsap Transit (via Route 93 or BI Ride) from the ferry terminal, or take one of the island’s taxis, Uber, or Lyft. 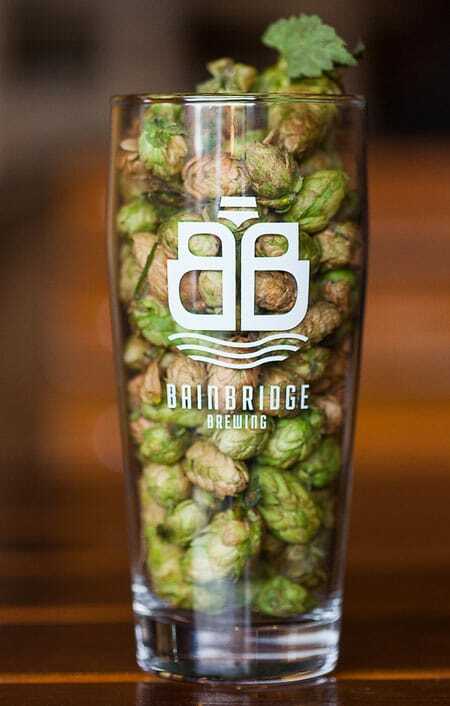 The Bainbridge Brewing Alehouse is just one block from the ferry terminal in downtown Winslow, at the corner of SR 305 and Winslow Way E next to the Bainbridge Island Museum of Art. View all the ways to get to us. Both the Brewery & Taproom and the Alehouse offer a variety of great snacks and local food items including: CB’s jumbo peanuts, D’Back German-style pretzels (most weekends), Crimson Cove smoked cheeses and salmon, Bavarian Meats German-style landjaegers, and tasty flavored Kettle chips. Take-out food is also allowed. 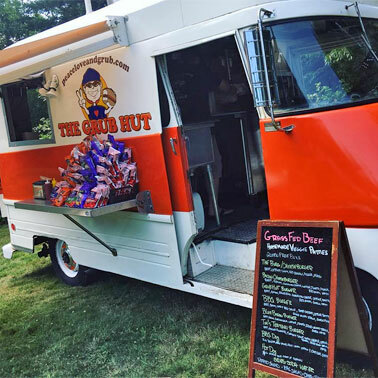 In addition, at the Brewery & Taproom, we also have two rotating mobile food vendors located nearby four days a week: The Grub Hut and Kurdish Kitchen Cuisine. And That’s A Some Pizza, Sweet Dahlia Bakery and Storyville Coffee are also located right across the parking lot from the Brewery & Taproom. 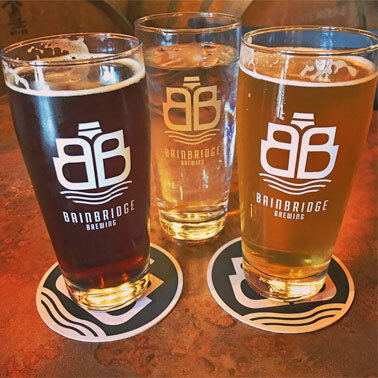 At the Bainbridge Brewing Alehouse in downtown Winslow, there are also many nearby food options including the new Agate Restaurant, BIMA Bistro, Town & Country Market, and several other nearby Winslow eateries. View the full list and details.